I’m writing about Nicola Griffith’s Hild for a conference, and realise that I haven’t read her three Aud Torvingen lesbian crime-fighter noir novels, which have only been published in the USA. (WHY, British publishers?) 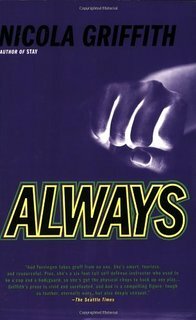 I happily begin reading the first one to arrive from Abebooks – Always (2007) – devouring its muscular prose as if I weren’t a vegetarian. It’s set in Seattle, where freelance investigator and former cop Aud Torvingen is investigating why her property rents are mysteriously low. There are luxe hotels, a film set under sabotage, crooked estate agents (realtors, sorry), and a brilliant stunt artist reduced to cooking for the crew. Interlaced with these episodes are the self-defence classes that Aud teaches back in Atlanta to a mixed group of women who may, or may not, have particular reasons for wanting to know how to defend themselves against attack in their home. Mmm, this is good. 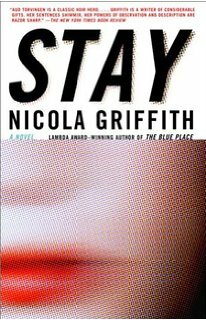 Then Stay (2002) arrives (different bookdealer), and I realise, oh whoops, Always comes after this one, so I put Always down, and begin Stay. More meaty prose, which begins with a catatonically grieving Aud building herself a new cabin in the woods as therapeutic occupation. Her best friend Dornan sends her to find his flighty fiancée Tammy, who’s in the clutches of a New York psychopath. Aud tracks, hunts, and seriously damages the perpetrator, and works to bring Tammy back out of her conditioned terror. In parallel, Aud is searching for a little girl, whom the perpetrator had been grooming for his next slave, and works through the ways in which a rich single woman can protect an unexpectedly smart child, living with a rigidly Christian family who cannot survive without the fostering money. This was also very good. Both novels are powerful, deliberate, impeccably paced with narrative control you respect and rely on. No tone is out of place, no description is too long, no characterisation overdone. They take the breath away, yet I was reading them backwards. Who is, or was, the now lost Julia? Where does Dornan come into it? Why has Aud abandoned her Atlanta apartment? The Blue Place (1998), the first in the sequence, takes three more weeks to arrive. I read it rapidly with a pretty clear recollection of the characters who will appear in Stay and Always, so I know who’s important, who’ll survive. Aud sees a house burn down, performs impromptu martial arts in a police gym, bodyguards a tiny Spanish daughter of power miserably job-hunting with US banks, and accepts the job of finding out why a faked painting was burnt along with the house. She accepts the job from Julia, who doesn’t know that the house fire was expected to have her in it. These three novels about Aud share a recurring focus on physical power and training the body. The martial arts episodes in The Blue Place and Always are balletic descriptions, delighting the mind’s eye with fluid movement, and building Aud’s character as a person who can do these marvellous physical things, finding peace, tranquillity and joy in their practice. The Blue Place gives the reason Aud left the police, because she was finding ‘the blue place’ of focused, timeless attack too beguiling. Is Aud a psychopath herself? She’s fully capable of love and passion, so is not psychopathic in its clinical sense, but her narrative voice has an unnerving tendency to note first how she could kill the person she’s just met, rather than thinking about them as people. We learn, too, why she began to think like this. There are fascinating, genre-hopping dichotomies throughout: exploring differences between heat and cold, swamps and fiords, giving and accepting, fighting for pleasure and fighting for her life. The novels were written to be read individually, but are clearly in a linear sequence: the adventures of Aud the rich, lonely, self-sufficient, loving, thorough, lesbian hunter, operating within and without the law. Griffith’s prose carries more than its own weight, flowing smoothly and effortlessly to show the qualities of vigour and physical energy that make Aud a magnificent creature to watch at her work. She performs martial art as an art, she shapes and makes a wooden chair, she digs a garden border as a cure for bad dreams and a muscle relaxant, she plays a game of pool in the bar as a demonstration of sexual predation, and she takes her time. I’m interested in the choice of Atlanta for Aud’s first appearance. As I write, a new film has come out featuring members of the Atlanta police as criminally flexible, so that was intriguing: not much has changed since The Blue Place came out in 1998. I remember Atalanta, the rich woman of privilege who could run faster than anyone else, but got caught when she stooped for beauty: she seems relevant to the novels, and Aud’s character. There are intriguing echoes in The Blue Place of Hild (isolated remarks about Hilda of Whitby, and Beowulf) which aren’t present in Stay or Always. 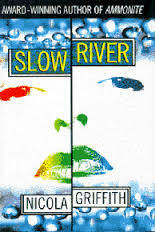 It’s as if, when Griffith began writing her next novel after Slow River (1995), she was balanced on the point of choices of what she could write next. She went for Aud, but early ideas about Hild stayed in her head. The three Aud novels build up Griffith’s techniques of writing the physicality of combat, with which Hild is filled. I cannot understand why these novels are not in print in the UK: they are superb. They also haven’t dated. They were written just as the internet became a web, but we don’t notice that the technology is, technically, historical. Aud uses a mobile phone in The Blue Place, but we don’t realise that it is a brick. She researches using computers and digitised records, but we don’t notice that there is no email or messaging. It’s a remarkable skill, to anticipate technical developments of the near future and build their assumed presence into the plot. But, of course, Griffith comes from science fiction: her ways are foresighted. Lovely description of 3 of my favorite books- along, of course, with Hild. It is indeed Griffith’s amazing prose which carries one along irresistibly.